Everyone has questions about how to apply Lean-Agile successfully in their own setting. Lean-Agile methods underlie virtually every Agile approach. 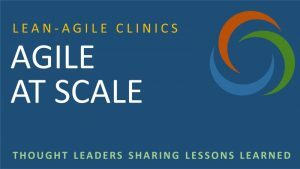 The topics discussed in this section will be useful for all organizations but are included in this clinic because they are particularly invaluable for anyone doing Agile at scale. Foundations for Agile at Scale addresses questions that apply to any size of organization. The bigger the organization, though, the bigger the impact these questions will usually have to your success. How Does Agile at Scale Increase the Delivery of Business Value?